The small-scale family park is located in the heart of the Vulkaneifel where the vast forests, picturesque towns, deep crater lakes and narrow river valleys determine the image. Particularly due to its unique location, the atmosphere and the geniality of the park. From the park, which is located on the edge of the town of Gerolstein on a ridge covered with deciduous and coniferous trees, you really have a beautiful view of Gerolstein, the rocks and the Kylldal. The park only has exclusively detached bungalows and holiday homes that offer you a lot of peace, space and privacy. The park has a children's pool, 2 playgrounds, a recreation room with table tennis tables, a mini-petting zoo that you can use free of charge. There is also a miniature golf course. In the summer months July and August there is an animation team especially for the children. In the morning you can buy delicious fresh bread rolls at the bakery cart (July and August). The bakery shop in the town is within walking distance (500 meters). The main building is equipped with a cozy bar with a fireplace and a terrace with a beautiful view over the rocks. NEW! At the park there is a Pop tennis court present instead of an ordinary tennis court. Poptennis is a new version of tennis (poptennis.com). POP Tennis is tennis played on shorter tennis courts with shorter and solid rackets, lower compression tennis balls and the same scores and rules as tennis. The only thing is that you have to serve privately. For both young and old, this (car-free) holiday park has a lot to offer. The views, space, peace and real holiday atmosphere that the park radiates you rarely encounter. You will receive a GeroGastCard upon arrival at the reception, giving you free access to the indoor and outdoor swimming pools in Gerolstein! You will also receive attractive discounts on bicycle rental, sauna visits, restaurants, golf course, summer toboggan run, etc. You can also visit museums for free!The small-scale family park is located in the heart of the Vulkaneifel where the vast forests, picturesque towns, deep crater lakes and narrow river valleys determine the image. Particularly due to its unique location, the atmosphere and the geniality of the park. From the park, which is located on the edge of the town of Gerolstein on a ridge covered with deciduous and coniferous trees, you really have a beautiful view of Gerolstein, the rocks and the Kylldal. The park only has exclusively detached bungalows and holiday homes that offer you a lot of peace, space and privacy. You will also receive attractive discounts on bicycle rental, sauna visits, restaurants, golf course, summer toboggan run, etc. You can also visit museums for free! The bungalow (52 m2) is fully furnished and has a spacious living room with sitting area, dining area, and flat screen TV. The separate kitchen is u.a. equipped with a coffee machine, kettle, toaster, refrigerator, dishwasher, microwave and ceramic hob. One bedroom has a double bed and vanity. The other bedroom is equipped with a bunk bed and the third bedroom with a single bed (all including pillows / duvet). The bathroom is equipped with shower / toilet / vanity. Electric heating (night stream). The terrace is equipped with garden furniture. Gero Guest Card / Tourist tax: € 1.00 per adult per night (from age 13). € 0.50 Children from 6 to 12 years per night. Children under 5 years for free: Indoor and outdoor pools Gerolstein free for our guests. Pets are not permitted in the bungalows and the campsite. From all houses you have access to our wireless internet connection. For each house there is a maximum of 2 codes available for an additional fee of € 3,00 per code. This access code can be used on 1 device at a time. The quality of the internet depends on the number of users at that moment. It can safely be said that the Eifel mountain range is a dream landscape. So different and yet so close! This beautiful environment was created by volcanic eruptions, earthquakes and tropical seas approximately 10,000 years ago. It makes an excellent holiday destination. Here you will find several deep crater lakes, Maare 'which in time were formed by volcanoes. These lakes which were formed by volcanoes. These lakes are an oasis for nature lovers, hikers and recreation fans. The "Hohe Eight" is the highest mountain (747 meters) in the Eifel and definitely worth a visit. 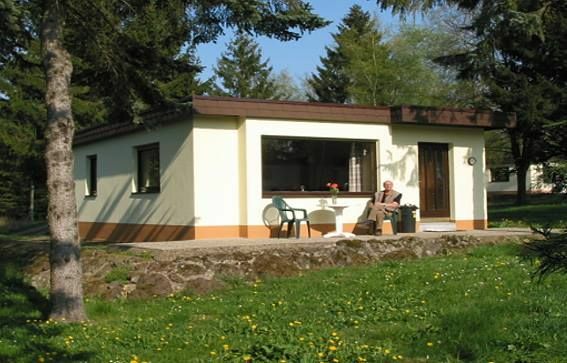 From this vantage point you have a fantastic view of the Eifel with its vast forests, rocks, fossil sites, wildlife parks, picturesque villages and ancient castles. In the autumn and winter the Gerolsteiner Land has a special charm. With bright autumn colors, fast flowing rivers, charming towns and fairytale snowy landscapes in winter, the Eifel is the perfect place to escape from the hectic pace of everyday life. And what is there to do here Sports, nature, culture and other attractions. Depending on your interest you can visit: the baptismal font museum in Losheim; a German-Belgian border market; Germany's oldest city, Trier; or Luxembourg. The Eifel Zoo in Lünebach is a wonderful zoo in the midste of a beautiful landscape. In addition to the many animals such as bears, tigers, lions etc., you will also find tropical trees and plants. For the hiking and cycling enthusiasts, there is a wide network of routes for each level of ability running through the Eifel. You can take the whole family to Kasselburg Pelm. Built between the 13th and 17th centuries, this castle is now actively used as a home for birds at the Adler und Wolf Park in Pelm. Here you will see soaring eagles, circling vultures, hawks, falcons, owls in large aviaries and even a crying wolf! In the Wolfsschlucht (wolf ravine) in the forests around the Kasselburg live the largest wolf pack in Western Europe. In short, a centrally located destination with endless possibilities!